Tough, clear, 100% silicone sealant. Gorilla sealant is great for kitchen, bath, window, doors, auto, marine Plumbing, gutters and more! ready for water exposure in just 30 minutes, this waterproof sealant is mold & mildew resistant. The clear silicone sealant and won't yellow, shrink or crack over time! directions: all surfaces should be clean and free of dirt, grease, oil and old sealant. Best if used above 40F. Cut tip to desired bead size. Apply sealant with a caulking gun. Smooth bead immediately after application, before a skin forms. Store in cool, dry location. Clean-up: wipe wet sealant off project immediately with a dry cloth. Isopropyl alcohol may be used according to solvent manufacturer s instructions. Click on the Gorilla link at the top of this page to see other quality products from the Gorilla glue company. 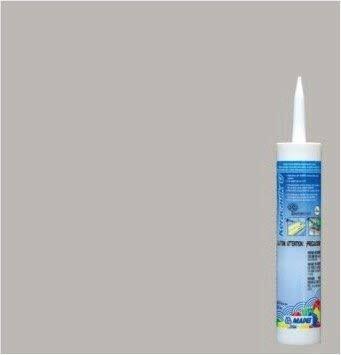 Tough, white 100% silicone sealant. Gorilla sealant is great for kitchen, bath, window, doors, auto, marine Plumbing, gutters and more! ready for water exposure in just 30 minutes, this waterproof sealant is mold & mildew resistant. 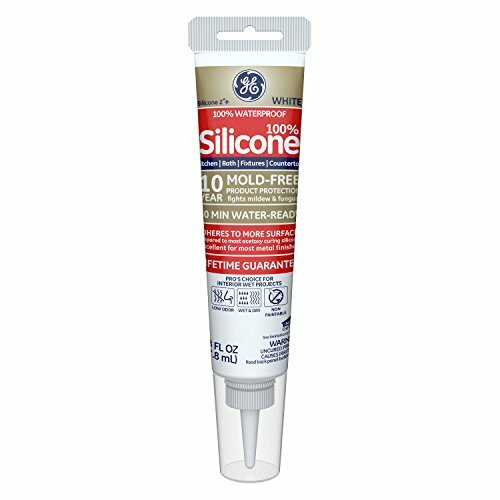 The clear silicone sealant and won't yellow, shrink or crack over time! directions: all surfaces should be clean and free of dirt, grease, oil and old sealant. Best if used above 40F. Cut tip to desired bead size. Apply sealant with a caulking gun. Smooth bead immediately after application, before a skin forms. Store in cool, dry location. Clean-up: wipe wet sealant off project immediately with a dry cloth. Isopropyl alcohol may be used according to solvent manufacturer s instructions. Click on the Gorilla link at the top of this page to see other quality products from the Gorilla glue company. 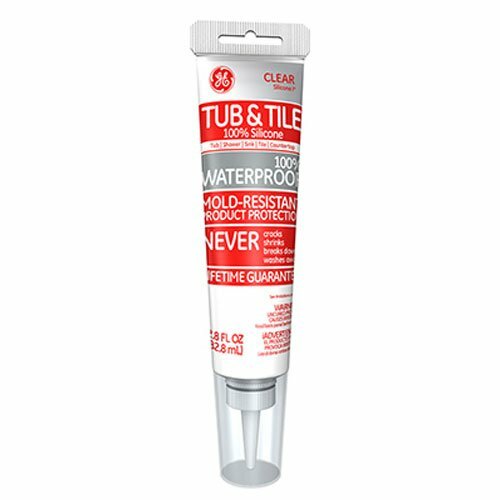 GE Silicone I Kitchen & Bath Permanently Waterproof - Caulk that keeps water out is a necessity in kitchen, bathroom and plumbing applications. 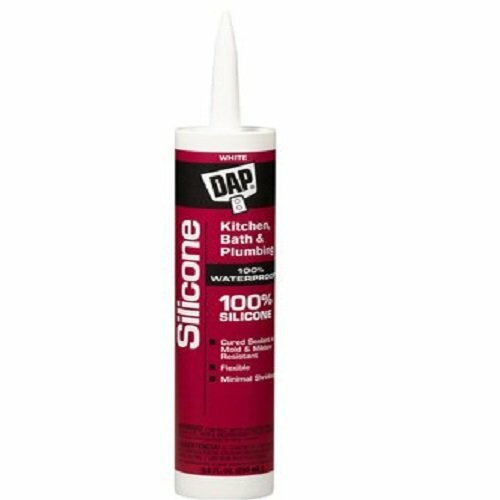 GE Silicone I* Kitchen & Bath caulk is permanently waterproof and it will not shrink, crack, or crumble over time like acrylic. Silicone chemically cures while acrylic is water-based (it simply dries as water escapes). Some acrylics can shrink up to 25 percent, leaving gaps and cracks for water to seep through. Those leaks can lead to water damage and mold growth. Why 100 percent silicone? Unlike acrylic, silicone is permanently: Waterproof Acrylic breaks down in water over time. Flexible Acrylic becomes less flexible and can even freeze at low temperatures, making it more likely to crack. Shrink-proof Acrylic shrinks as the caulk dries. This shrinking can cause cracks over time. Crack-proof Acrylic hardens, cracks and crumbles over time when exposed to extreme heat and the sun's UV rays. Made in USA. GE Silicone 1 All Purpose is a 100% silicone and 100% waterproof sealant ideal for a wide range of projects exposed to harsh weather from the attic to the basement. Permanently flexible, it stretches and moves with the house and will never break down due to ultraviolet rays or freezing temperatures. Formulation is resistant to unsightly stain causing mildew growth. Guaranteed for as long as you own your home. GE 100% Silicone is 100% waterproof and 100% weatherproof. Use to build or repair aquariums. Provides a waterproof and watertight seal. Harmless to fresh and saltwater fish when cured. Will not crack or shrink. Meets ASTM Specification C290, Class 25, Type S, Grade NS. 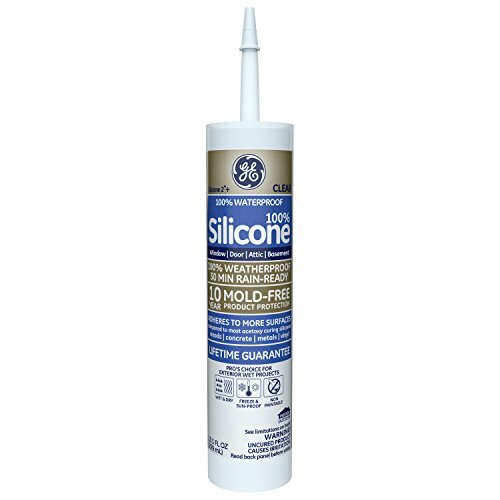 GE Silicone 1 Tub & Tile is a 100% silicone and 100% waterproof sealant that is resistant to unhealthy and unsightly stain causing mold and mildew growth. 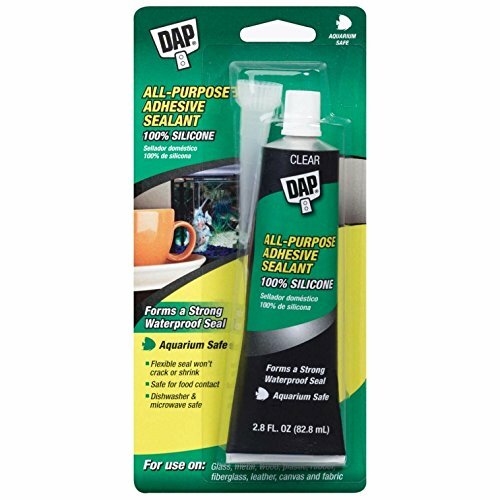 Ideal for sealing around sinks, tubs, showers, fixtures, countertops, backsplashes and plumbing projects. Easy to apply with excellent adhesion, it remains permanently flexible and will never crack, shrink, break down or wash away. Guaranteed for as long as you own your home. TOUGH, CLEAR, 100% SILICONE SEALANT. 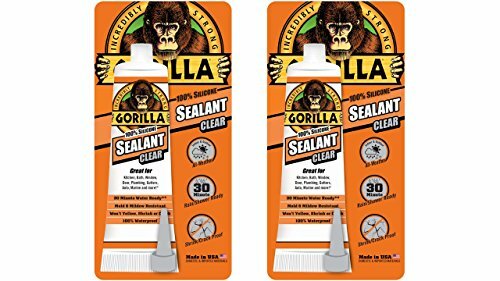 Gorilla Sealant is great for kitchen, bath, window, doors, auto, marine plumbing, gutters and more! Ready for water exposure in just 30 minutes, this waterproof sealant is mold & mildew resistant. The clear silicone sealant and won't yellow, shrink or crack over time! Directions: All surfaces should be clean and free of dirt, grease, oil and old sealant. Best if used above 40F. Unscrew cap, fold and screw-on nozzle. Cut to desired bead size. Apply sealant, pushing bead ahead of nozzle. Smooth bead immediately after application, before a skin forms. Storage: Replace cap tightly to prevent material from curing. Store in cool, dry location. To re-use nozzle, remove sealant from nozzle once cured. Clean-Up: Wipe wet sealant off project immediately with a dry cloth. Isopropyl alcohol may be used according to solvent manufacturer s instructions. Click on the Gorilla link at the top of this page to see other quality products from the Gorilla Glue Company. 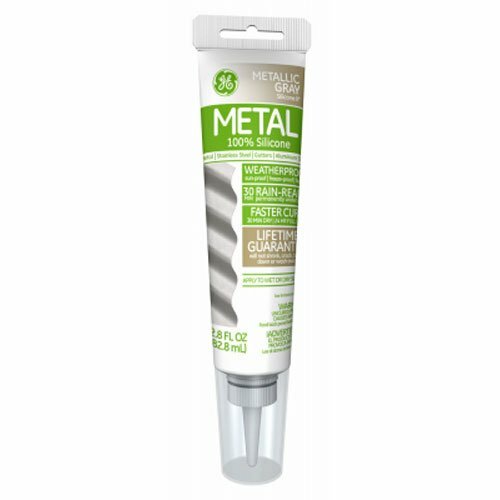 GE Silicone 2+ Metal 100% Silicone is a 100% waterproof and weatherproof sealant for exterior projects with metal applications. It applies to wet or dry surfaces, can be exposed to rain in as little as 30 minutes and cures in approximately 24 hours. It is permanently flexible and will not shrink or crack when subject to ultraviolet rays or freezing temperatures. Adhere to porous materials such as brick and mortar. Guaranteed for as long as you own your home. Excellent for a wide range of exterior weatherproofing and sealing projects including steel sheds, metal roofs, trailers, recreational vehicles, gutters, around vents and pipes. GE Silicone II Aluminum & Metal 100% Silicone Caulk- THREE-HOUR RAIN-READY - Caulk has to have enough time to build adhesion to the surface and cure or dry adequately so it won't wash away when exposed to water. That means if rain is in the forecast, homeowners and pros typically will have to delay or cancel a project when using most caulks. If not, the rain might wash the caulk away and the job will have to be redone. Silicone caulk, such as GE Silicone II* Aluminum & Metal, develops strength and adhesion quickly so it can be exposed to water in as little as three hours. Some caulk requires up to 24 hours or longer before water exposure. For homeowners trying to squeeze home maintenance projects into the weekend or pros who are looking to move to the next job, GE Silicone II* caulk can decrease the waiting time, helping increase convenience, speed and efficiency. SUN-/FREEZE-PROOF - The outside of a home is exposed to harsh outdoor elements throughout the year. Extreme heat, the sun's UV rays and freezing temperatures can cause acrylic caulk to lose its flexibility and degrade. The permanent flexibility of GE Silicone II* keeps it from breaking down so it can protect a surface even as joints expand and contract. Degraded acrylic caulk can crack and crumble over time, leaving gaps for air and water to seep through. Why 100 percent silicone? Unlike acrylic, silicone is permanently: Waterproof Acrylic breaks down in water over time. Flexible Acrylic becomes less flexible and can even freeze at low temperatures, making it more likely to crack. Shrink-proof Acrylic shrinks as the caulk dries. This shrinking can cause cracks over time. Crack-proof Acrylic hardens, cracks and crumbles over time when exposed to extreme heat and the sun's UV rays. Made in USA. 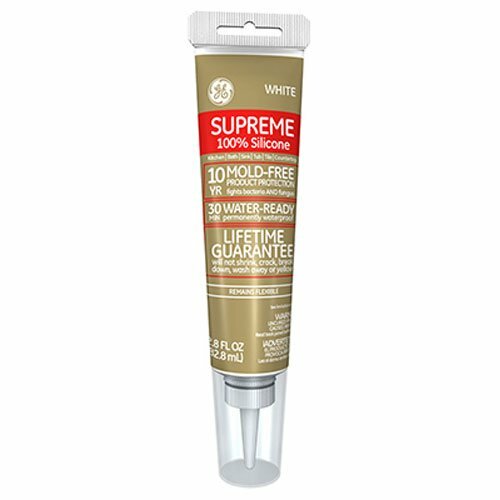 GE supreme silicone slashes wait times, helps block weather and water. GE supreme silicone caulks are making life even easier for consumers and pros with shorter wait times and outstanding durability. In as little as 30 minutes, these caulks are ready for water exposure to get the job done faster, save time and money, and still provide the same reliable protection. 2.8 oz White Won't shrink or crack Waterproof 30-minute shower-ready 10-year mold-free product protection 100% Silicone Builds adhesion quickly & can withstand water a hour after application Mold free product protection helps keep the cured caulk Mold & mildew free, non paintable Use for showers, tubs, sinks, tile, countertops, fixtures, & other plumbing applications Adheres to most ceramic tile, laminate, glass, metal, plastic/fiberglass & granite Made in USA. Mapei Keracaulk U (white) is a premium-grade, easy-to-use, easy-to-clean siliconized acrylic caulk formulated to match the color and texture of Mapei unsanded grouts. RD Pro industrial grade rtv 100% silicone sealant is a high performance sealing and glazing compound that is ideal for use in most oem and maintenance applications. Forms a strong, durable and weather-resistant seal and provides excellent adhesion to most non-porous surfaces. 50 year warranty. Solvent clean up. Nsf listed.